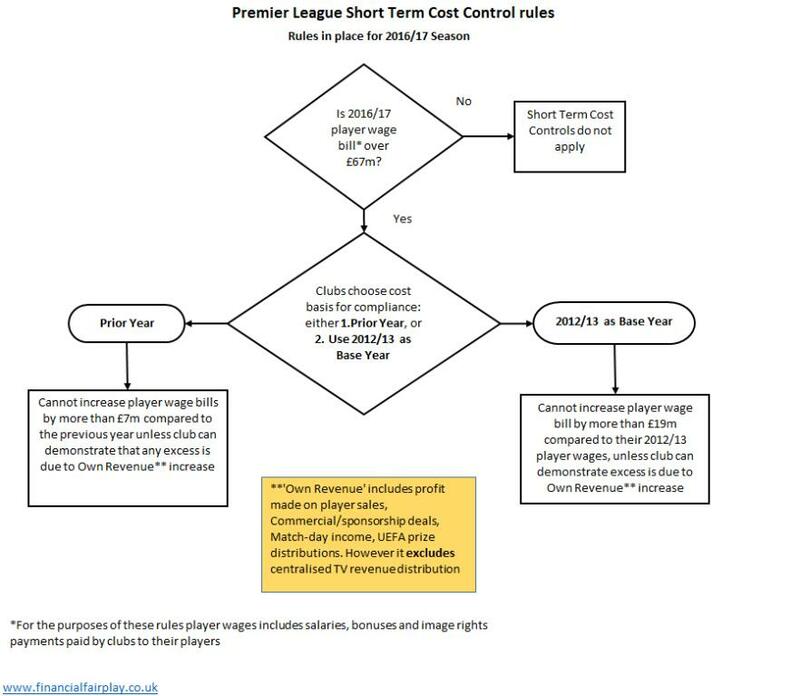 Premier League clubs have voted to continue their Short Term Cost Control (STCC) rules; updated rules will come into effect from next season (2016/17) and will apply for three-year duration of the next TV deal. The STCC rules first came in three years ago and are designed to help ensure sustainability of the top-flight clubs by ensuring that clubs don't spend the TV deal on hugely increased wages. 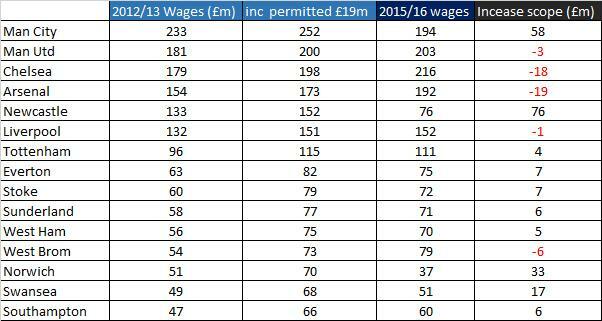 It is interesting to note that the rules allow a newly promoted club to immediately increase wages to £67m if they wish. So we could, in theory, see a club like Brighton increase their wages from somewhere around £18m (excluding promotion bonuses) to £67m over the summer. Currently, the Championship clubs not in receipt of Parachute Payments only get around £5m in TV revenue - the new TV deal in the Premier League will be worth around £100m from next season. Promoted Clubs could therefore immediately increase wages to £67m and still have plenty of cash to spare in their first season. What could possibly go wrong? Interestingly, we have seen a recent trend for newly promoted clubs doing rather well in the Premier League and the rules certainly help newly promoted clubs to compete. Watford brought in 16 new signings during last summer and we could see the newly promoted clubs act in a similar manner. Although it can be a challenge to get newly acquired players to gel quickly, the newly promoted clubs generally operate from a low salary base and can work off a clean slate and can make maximum use of their wage allowances. Established Premier League clubs often don't have this flexibility and are often hampered by a glut of long-standing players on high wages, with many often out of favour and purchased by a previous manager (as Sunderland, Aston Villa and Newcastle can testify). These established PL clubs can't always get as much bang for their buck as the promoted clubs (who will also usually have a more long-standing and more recently successful manager). The rules that allow clubs to refer back to 2013/14 will, however, give some extra flexibility to the clubs that have been in the Premier League since that season. The following table shows how the longer-standing clubs are affected by the rules and how most of these clubs are therefore allowed a higher wage increase if they wish. The clubs that are showing in red actually should have no significant issues - clubs have been able to write large commercial deals since 2012/13 on the back of the relentlessly increasing appeal of the Premier League (eg Chelsea's Yokohama tyres deal); the rules don't materially hamper the longer-standing, larger Premier League Teams. It is also important to appreciate that the current Premier League Profit and Sustainability rules are still in place - these rules sit alongside the Short Term Cost Control rules and ensure clubs don't lose more than £105m over three rolling seasons. It is interesting to note how Man City have benefited from their rather calculated decision to classify Mancini's pay-off as 'wages' - this inflated the club wages and, assuming it isn't contested by the PL, would allow more scope for wage increases (if required). Of course, City have increased Commercial Income since 2013/14 (largely from state-influenced Abu Dhabi companies) so have additional capacity for wage increases in any event.